My Historical Novels Review article has been published! 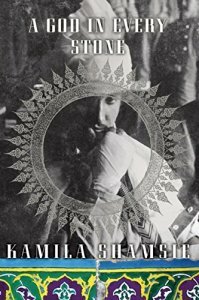 Kamila Shamsie has written novels of extraordinary power and depth, epics that transcend genres and time periods. Her historical fiction is packed with hard-hitting themes and exploration of cultures and locations — and combinations of these — that one does not commonly see on bookstore shelves. Shamsie was born in Karachi, Pakistan, in 1973, into an English-speaking family; her mother and grandmother were both writers. She herself studied creative writing in the United States, publishing her first novel in 1998 while a graduate student at the University of Massachusetts. Now she divides her time between Pakistan and the UK, as well as teaching in the United States. She has written six novels, two of which are historical fiction. Burnt Shadows, her fifth novel (Bloomsbury, 2009; reviewed in HNR Issue 48, May 2009), was shortlisted for the prestigious Orange Prize and translated in more than twenty countries, while her latest novel, A God in Every Stone (reviewed in this issue), was released in the United States by Atavist Books (August 2014). Her historical works show her passion for unearthing stories related to Pakistan’s history, as well as utilizing the influence of intercultural factors on relationships as a metaphor for larger political or social issues. Both these books are intricate literary feasts, exploring the tumultuous periods and relationships between vastly different cultures from the First World War to the beginning of the War on Terror. With so much variation in each novel, just how did the author’s conceptions for her multicultural epics arise? A God in Every Stone transports the reader from the killing fields of Flanders in 1915 to the bloody Peshawar massacre of 1930, while digging through ancient discoveries that intertwine with the dramatic events of the present. Young London archeologist Vivian Rose Spencer, fascinated by the history of ancient empires, joins a dig in Turkey in 1914. A bond forms between her and Turkish archeologist Tahsin Bey, with promise of a future engagement; what happens to their relationship, however, is a tragic consequence of a wartime choice Vivian makes. She also mentors Najeeb, a gifted Indian boy, in whom she senses great potential. In turn, Najeeb is quite taken with her search for the silver circlet of Scylax, a fifth-century BCE explorer who worked on behalf of the Persian king Darius I, and indeed he pursues this passion, in spite of the antagonism of Qayyum, his brother, who is an infantryman in the 40th Pathan Regiment of the British Indian Army. After returning to Peshawar from Flanders, where he was wounded during the battle of Ypres, Qayyum discards the idea of violent revolt against the Raj. He joins an organization of nonviolent revolutionaries but must defy Pashtun tradition and convince his fellows of the plausibility of nonviolence. The strained relationship between the brothers, separated by an immeasurable cultural divide, again surfaces when Najeeb discovers an artifact of great archeological importance and tries to re-establish contact with Vivian at the dig in April 1930. Soon after this, the simmering unease erupts as a nonviolent — yet provocative — protest turns deadly, resulting in the Qissa Khwani Bazaar massacre. The forces of empire and the anger of second-class Indian subjects clash, as do the past and the present, and the brothers — one a protégé of the British, the other a disillusioned soldier turned nonviolent anti-imperial activist — finally cross into each other’s worlds. Burnt Shadows picks up, in a manner of speaking, where A God In Every Stone leaves off, during the demise of the British Raj. However, the novel begins unexpectedly with the horrific atomic bombing of Nagasaki. Hiroko Tanaka, a 21-year-old schoolteacher-turned-wartime munitions factory worker, is content until her lover, Konrad Weiss, an idealistic and artistic German expatriate, suddenly becomes nothing more than a shadow on a rock and Hiroko is left branded with burns in the shape of the birds on the kimono she was wearing on that fateful day. As a hibakusha — a survivor of the bomb — Hiroko is ostracized from Japanese society, and she finds refuge in New Delhi. It is the end of the British reign in India, and the rest of the story encapsulates, through the protagonists’ relationships, the chaotic demise of the Raj and the devastating upheaval caused by man-made boundaries combined with ethnic and religious hatreds. Burnt Shadows is an historical epic in every sense of the term — spanning sixty years, four countries, and several generations. To that effect, we see interwoven relationships that cross continents, and world events that have rippled consequences as, once again, Shamsie tackles large themes from distinct and unique angles. In Burnt Shadows, the reader views the empire and its subjects’ relationships from a Japanese perspective. The Partition, the nuclear standoff between India and Pakistan, 9/11, the involvement of the CIA and private military companies in the war in Afghanistan, and finally — perhaps most intriguing of all — a foray into the minds of radical Islamists — are all political topics covered in Burnt Shadows. This is a rich book, full of insights into human nature and human relations as well. About the contributor: Long-time member of the HNS and National Book Critics Circle, ANDREA CONNELL is a reviews editor for HNR and has been professionally reviewing historical fiction for over a decade. For her day job, she is a project editor for a small university press, as well as a freelance editor for a think tank in the Washington, DC area. 1. Email interview with Kamila Shamsie, 29 September 2014, posted in its entirety on thequeensquillreview.com. 3. Natalie Hanman, “Kamila Shamsie: Where is the American writer writing about America in Pakistan? There is a deep lack of reckoning,” The Guardian, 11 April 2014.